I really wish I still had my Windows computer. I had a lot of games installed in it but alas, it fell prey to various viruses that have made my PC their home. 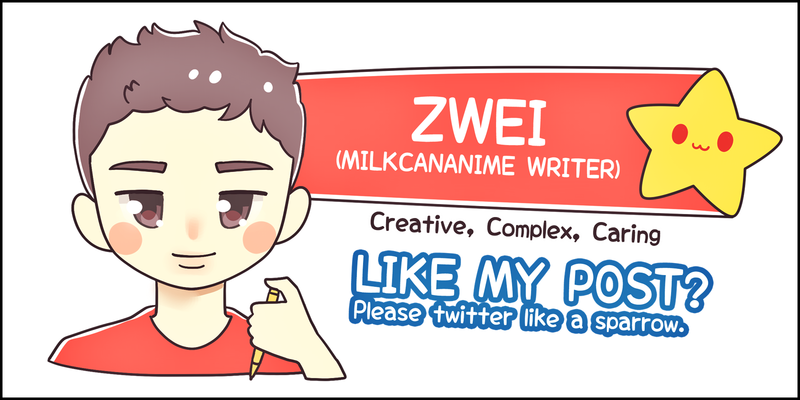 My visual novels, FPS, RPG. They’re all gone! Now, I’m using a Macintosh and well there are a few limitations. But since I don’t game a lot anymore, it doesn’t really matter. I have my 3DS and my PS Vita to handle my boredom, though the Internet is my default gateway to entertainment. I remember playing this particular game, which I was so engrossed on that I didn’t really go online for a few days. The game was so challenging that you will always want to beat it. Well, that’s how it felt for me. How I miss Touhou. Touhou or Touhou Project or Project Shrine Maiden is a doujin game series. It is mostly known for it being a scrolling bullet hell game where players are literally in a bullet hell. It is developed Team Shanghai Alice, which is made up of only one member known as ZUN who is responsible for everything. Like from its programming to its graphic and of course the wonderful music that accompanies it. A group called Amusement Makers first introduced the game but it was discontinued a few years. ZUN then release The Embodiment of Scarlet Devil for the Microsoft Windows on August 2002, which started the Touhou Project, after he separated Amusement Makers. From there, the Touhou Project franchise grew to a number of games, music, manga and light novels, which we all come to love and adore. You could say what made Touhou to what it is today is its fans. 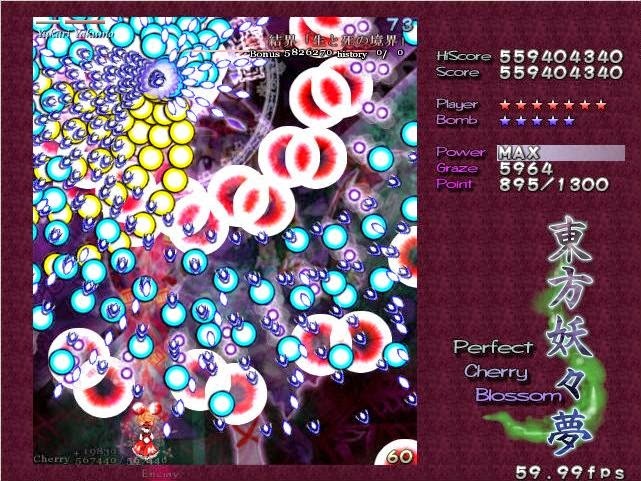 A few of the games that I’ve played before are Embodiment of the Scarlet Devil, Perfect Cherry Blossom, Imperishable Night, Phantasmagoria of Flower View, and Scarlet Weather Rhapsody. I didn’t continue playing the other series that followed after since I changed to a Mac. I could install Wine or bootcamp my Mac but it will seriously lag my Mac and also I don’t play much games lately. The controls for the game are actually pretty simple. Arrow keys to control direction. Z is use to shoot, which you can hold down for rapid fire. X for the bomb which is limited and most importantly, left shift which is use to slow down your character’s movements and it decreases your hit box’s size. This really helps in clearing harder stages. There is also this thing called grazing which is related to the smaller hit box where the bullets will graze your characters sprite but it doesn’t make you die as your hit box is much smaller. Below is a video, which help explain Touhou in a bit more detail. Let’s get to know some of the characters. First up, the main character that appears in all the main games in the series. Hakurei Reimu is a 15-year-old human who is also a shrine maiden. She lives in the Hakurei Shrine, which is often visited by various individuals. In the games you follow her as she is called upon to investigate strange incidences that happened throughout Gensokyo. Reimu has the ability to manipulate various amulets where she also uses her own spiritual power to fight. Her character can be described as easygoing, devoted to her responsibilities and also highly optimistic. Next is one of the important sub-characters Kirisame Marise. She is also a human who is a magician. She lives in the Kirisame household in the Forest of Magic. She first appeared as one of the characters you’ll fight against but later became one of them you could play as. She is close friends with Reimu but at times may be against her. Her character is known as a hard worker who is trying to catch up with Reimu. She is also very confident of herself and also very curious. Just like some anime character I know. 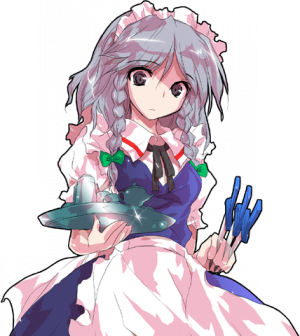 And finally, my favourite character, Izayoi Sakuya. Izayoi Sakuya, a human, is the chief maid of the Scarlet Devil Mansion. She can be said to be a character full of mystery but she is definitely very loyal to her mistress, Remilia Scarlet who is a vampire. She is proficient with the knives and has the power to manipulate time, which is quite handy, as she is able to place the knives she can attack her opponent from al directions. There is also wonderful doujins of the Touhou Project that are created. There are the wonderful art pieces all around the Internet. The incredible music. And also the animated videos. One of my favourite is the OVA that were made by fans of the series. A Summer Day’s Dream is one of the doujin anime that was created and it is actually quite well done. Oh, and there is also “Bad Apple”. I really like this video in particular. Well, I guess I can end it there. Hope you guys enjoy the Touhou universe in your future endeavors. I should start brushing up the Bad Apple dance. It’s been a few years since I did that. No Comment to " Do you even Touhou? "